General Information: Summer squash, members of the Cucurbitaceae family and relatives of both the melon and the cucumber, come in many different varieties. While each type varies in shape, color, size and flavor, they all share some common characteristics. The entire vegetable, including its flesh, seeds and skin, is edible. In addition, some varieties of the squash plant produce edible flowers. Unlike winter squash, summer squash are more fragile and cannot be stored for long periods of time. 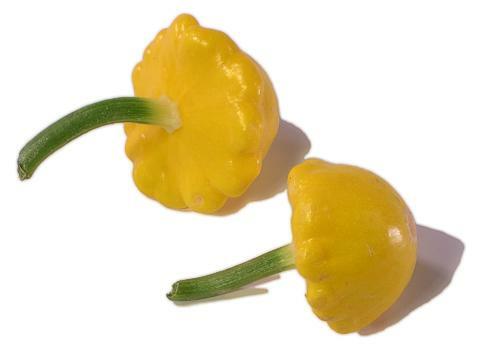 Pattypan Squash is a smaller small saucer-shaped squash features skin that can either be pale green or golden yellow in color. Its cream-colored flesh is more dense and slightly sweeter than that of zucchini. Though considered a vegetable in cooking, botanically speaking, squash is a fruit (being the receptacle for the plant's seeds), and not a vegetable. Nutritional: Although not as potent as root vegetables like burdock, garlic or onion, squashes have been found to have anti-cancer type effects. Although phytonutrient research on squash is limited, some lab studies have shown vegetable juices obtained from squash to be parallel to juices made from leeks, pumpkin, and radish in their ability to prevent cell mutations (cancer-like changes). History: Archeological evidence shows that squash was first cultivated in Puebla, Oaxaca and Mexico State some 8,000 to 10,000 years ago . Its cultivation subsequently spread across the Americas. Squash was one of the "Three Sisters" planted by Native Americans. The Three Sisters were the three main indigenous plants used for agriculture: maize (corn), beans, and squash. These were usually planted together, with the cornstalk providing support for the climbing beans, and shade for the squash. Modern day squash developed from the wild squash that originated in an area between Guatemala and Mexico. While squash has been consumed for over 10,000 years, they were first cultivated specifically for their seeds since earlier squashes did not contain much flesh and what they did contain was very bitter and unpalatable. As time progressed, squash cultivation spread throughout the Americas, and varieties with a greater quantity of sweeter-tasting flesh were developed. Christopher Columbus brought squash back to Europe from the New World, and like other native American foods, their cultivation was introduced throughout the world by Portuguese and Spanish explorers. Today, the largest commercial producers of squash include China, Japan, Romania, Turkey, Italy, Egypt, and Argentina.